This was the perfect Yelp Elite to start off the new year. Especially after two months of holiday parties. Fresh Millions is a fast-casual “eat healthy” concept food chain that has endless combinations available from their menu. They offer lunch or dinner entrées that include made-to-order gourmet salads with a variety of mix-ins, hot bowls, soups, and grilled paninis. They first opened in 2015 and locations have been popping up all over the Valley since then. People love choices these days and Fresh Millions allows you to choose what you want on your entrée. You basically order on one side of the stainless-steel counter, pick your toppings, pay at the other side of the counter and take your food to a table. For bowls, you choose your base (brown rice, noodles, spinach, romaine, etc), a protein (chicken, shrimp, steak, tofu), a sauce (basil pesto, Thai peanut, green curry, etc) and four mix-ins. You can even go half-and-half base and do rice and romaine/spinach. The cooks will mix and sauté up your creation and you can watch the magic happen right over the counter as they are an open kitchen. For the little ones, they have a healthy fresh kids’ menu. If you are in a hurry and don’t want typical unhealthy greasy fast food, this is the place to go. 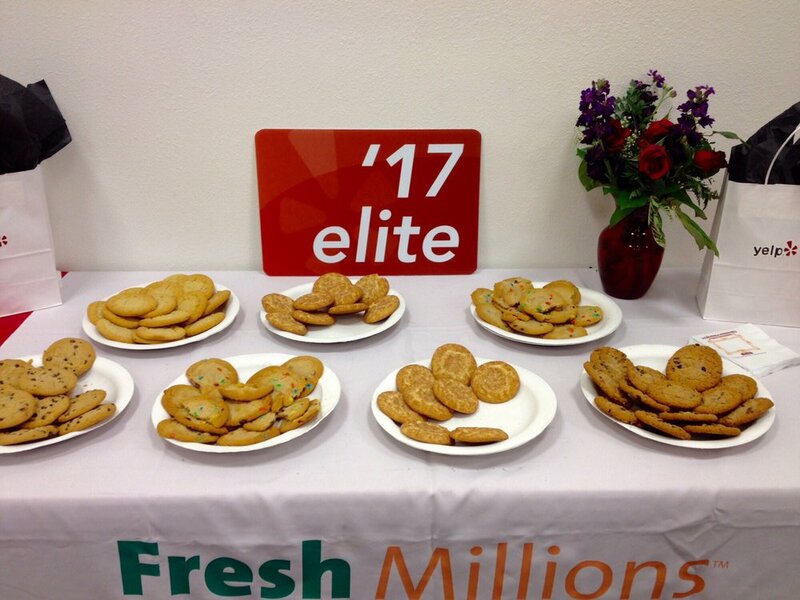 We had a Yelp Elite event at Fresh Millions to celebrate their grand opening location in Gilbert. I love these events that introduce me to new places around the Valley. I also love getting more acquainted with my fellow Yelp Elites as these are the people with the most knowledge of where the best eats are in the Valley. We were given sandwich and salad samples and able to create our bowl. For dessert, we had a table full of yummy cookies to choose from. This was a fun event and I look forward to a return visit. This entry was posted in Deli Food and tagged choices, combinations, cookies, eat healthy, fast casual, food chain, Fresh Millions, Gilbert, gourmet salads, healthy, holidays, hot bowls, mix-ins, neat to be Elite, noodles, open kitchen, panini, protein, rice, Salad, Sauce, soup, toppings, YEE, yelp, Yelp Elite, Yelp Phoenix by ttimmons. Bookmark the permalink.